FRIDAY, Jan. 11, 2019 (HealthDay News) — Pregnant women who get a flu shot protect not only themselves, but also their developing baby, health officials report. When a mom-to-be gets the flu, she can be so sick she needs to be admitted to a hospital’s intensive care unit. And new research finds her baby then runs the risk of being born preterm, underweight and with a low “Apgar score” — a gauge of an infant’s overall health. “The findings support the importance of pregnant women receiving the influenza vaccine, and of prompt treatment with antiviral medications for pregnant women suspected of having influenza,” said lead researcher Kim Newsome. She’s a health scientist at the National Center on Birth Defects and Developmental Disabilities at the U.S. Centers for Disease Control and Prevention. Everyone aged 6 months and older should get a flu shot every year, the CDC recommends. That guideline is especially important for pregnant women, the very young, the very old and anybody with a chronic illness. These people are at a high risk for complications of the flu, according to the CDC. Flu can range from mild to severe, but it’s especially risky for pregnant women. During pregnancy, women undergo changes to their immune system, heart and lungs that make them more prone to severe illness from flu throughout their pregnancy and in the two weeks following delivery, the agency warns. With the flu now spreading throughout the United States, it’s still not too late to get vaccinated. Among the active flu strains circulating this season are influenza A H1N1 and H3N2. This year’s vaccine offers protection against both of these strains. Last week, 19 states reported high flu activity, and it was widespread in 24 states. Flu activity was high in Alabama, Arizona, Colorado, Georgia, Illinois, Indiana, Kansas, Kentucky, Louisiana, Massachusetts, Mississippi, Nevada, New Jersey, New Mexico, Oklahoma, South Carolina, Texas, Utah and Virginia, according to the CDC. For their research, Newsome and her colleagues studied 2009 data on 490 pregnant women with flu and nearly 1,500 pregnant women who did not get the flu that year. In 2009, the H1N1 flu was at pandemic levels. About 60 million Americans came down with flu, as many as 400,000 were hospitalized, and up to 18,000 died, the CDC reported. Last year, when the more virulent H3N2 virus was predominant, millions more got sick, nearly 1 million were hospitalized, and as many as 80,000 died, according to the CDC. 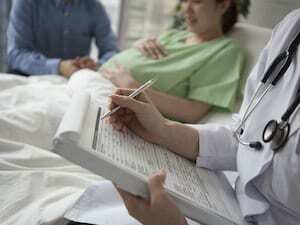 In 2009, pregnant women who were admitted to an intensive care unit for flu were more likely to deliver preterm infants, low birth weight infants and infants with low Apgar scores, compared with women who didn’t come down with influenza. Women with the flu who weren’t hospitalized or were hospitalized but not admitted to the intensive care unit didn’t have significantly higher risks for any of the complications studied, the researchers said. The report was published Jan. 9 in the journal Birth Defects Research. Dr. Rahul Gupta is chief medical and health officer at the March of Dimes. “The rate of flu vaccination of women of childbearing age, and especially those in the first trimester [of pregnancy], is unacceptably low,” he said. Although the vaccine isn’t 100 percent effective in preventing flu, people who are vaccinated and get the flu get a much milder case, Gupta noted. “Getting the flu vaccine early in pregnancy is one of the most important things you can do for yourself as an expecting mom,” he said. Gupta thinks that the anti-vaccine movement has created doubts about the safety of the flu vaccine during pregnancy. “Despite the false data about vaccines’ link with autism, some are understandably cautious and may falsely believe that the vaccine can be harmful,” he said. Women who aren’t sure they should get a flu shot should have a discussion with a medical professional, he advised. Getting vaccinated is one more thing you can do — like taking vitamins, eating right, exercising, and not drinking or smoking — to ensure the health of your baby, he explained. For more on pregnancy and flu, visit the March of Dimes.